This fact sheet was compiled for the Council on Contemporary Families by scholars at diversitydatakids.org. 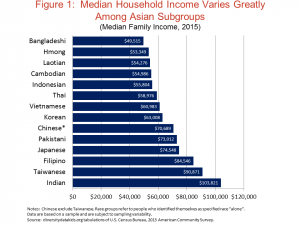 Asian Americans are often seen as the most affluent racial/ethnic minority group in the United States, the “model minority.” It is true that, overall, their income, educational attainment and neighborhood environment is better than that of Hispanics and Blacks. 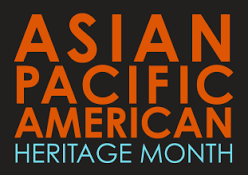 However, what is often missed is that the Asian American experience is highly diverse. There are significant differences by national origin and across geographic areas. It is important to uncover the variation in the Asian American experience so that we can better understand and address the strengths and vulnerabilities of different subgroups. Asians are more concentrated in the highest-opportunity neighborhoods of U.S. metropolitan areas than are any other major racial/ethnic group. But this does not mean that Asians are uniformly advantaged. Asian racial subgroups are extraordinarily diverse, and there is tremendous inequality among these subgroups. 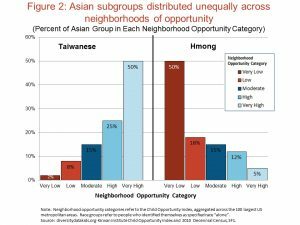 For example, while 50 percent of Taiwanese reside in very high-opportunity neighborhoods (the best 20 percent of neighborhoods within their metro area) this is true for only 5 percent of the Hmong population (see Figure 2). In addition to the Taiwanese population, Koreans, Japanese, and Indians are highly concentrated in very high-opportunity neighborhoods. By contrast, Hmong, Cambodians, and Laotians are highly concentrated in very-low opportunity neighborhoods (the lowest 20 percent of neighborhoods within their metro area.) A full half of Hmong, 38 percent of Cambodians, and 34 percent of Laotians live in such low-opportunity neighborhoods, compared to only 2 percent of Taiwanese and 4 percent of Koreans. Even within the same Asian and Pacific Islander subgroups, the share living in the highest opportunity neighborhoods of their metro area differs substantially across metros. For example, 66 percent of Chinese living in Pittsburgh reside in the very high-opportunity neighborhoods of that metro, but only 19 percent of Chinese living in San Francisco reside in the very high-opportunity neighborhoods of that metro. But again, this average advantage does not accrue to all groups of Asians. One symptom of the extreme segregation facing low-income Asians is a lack of access to support systems such as Head Start programs. The percentage of poor Asian children with access to a Head Start Center is lower than for their counterparts of different racial/ethnic backgrounds. Only 22 percent of Asian and Pacific Islander children in families with incomes below the poverty line reside in a neighborhood that includes a Head Start center, compared to 31 percent of poor Black children and 31 percent of poor Hispanic children. Fabulous to have this disaggregated data and analysis. Thank you!